A refreshing balance between relaxation and exploration, our new Sun holiday is packed with added extras to help you make the most of your time in Corfu. Soak up the sunshine, unwind in the hotel spa and head off the beaten track on two guided walks and a cruise on a traditional Greek fishing boat; if you need time to rest and restore, but also want to see the island, this trip truly offers the best of both worlds! A Solos favourite, our hotel is set amidst beautiful gardens in the Kontokali peninsula. Offering breath-taking views over the Ionian Sea and towards Corfu Town, the resort gives us all the necessary ingredients for a relaxing week in the sun. The hotel’s private sandy beach is a stone’s throw away, where you can take part in various watersports such as water-skiing and paragliding. With tennis courts, volleyball, mountain biking and a sports entertainment programme, you'll never be short of something to do! Our special package includes three fabulous excursions and entrance into the Kontokali spa and indoor pool, offering a perfect blend of relaxation and discovery. Why not treat yourself to a treatment in the spa, we are of course on holiday so a great excuse! Head off the beaten track on our included guided walk. After entering the town’s historical centre via the old town gate, we’ll head to Porte Remounda, along Guilford Street and its many antique shops to the Venetian Town Hall square. 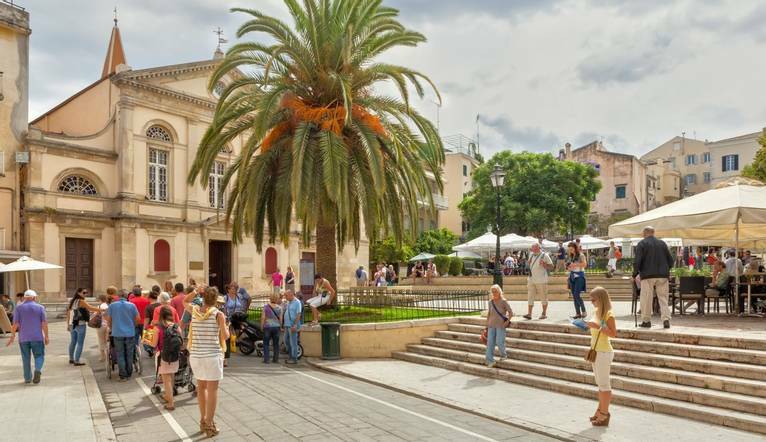 Our walk will also take in the Listons terraces along Esplanada Square, St Spiridon church, the fish market and San Rocco square, home to the Patounis original olive soap factory – which is also the oldest in Europe! The final part of our tour takes us past the Agora market, via the tunnel under New Fortress, to the Jewish quarter and the Venetian Well, via the small cobbled stone alleys, past the university and ending in the Art Café. We’ll then have ample time for leisure, shopping and lunch. Our third included excursion is a guided island tour, beginning in the village of Agia Deka. After following a hidden country road through ancient olive groves and forgotten hamlets, we’ll reach the pretty mountain village of Xlomos. On a clear day, we’ll be greeted with beautiful sea views towards Paxos and the lake and dunes below us. We will then descend for lunch (not included) in the traditional fisherman village of Petriti. After lunch we will head north again, this time along timeless villages and the unknown west coast before stopping off for a visit of The Empress Throne at Pelekas. Here we can admire the fabulous central island views of Corfu Town and the Achilleion Palace. Sailing on a caique, a former Greek fishing boat, is one of the most relaxing leisure activities we can do on Corfu. Our included excursion sails us along the pretty coastline washed by deep blue seas in the shade of Mount Pantokrator, an area considered by many as the most beautiful part of the island. Relax and soak up the marvellous views around you, including the mysterious Albanian coast, and famous spots like Kouloura and Kalami. In Kassiopi, you will have ample leisure time for a stroll, some shopping or a drink at one of the many waterfront terraces. The captain will then cast anchor in a bay where we can enjoy a picnic and a swim before heading to another hidden cove. Located on a sandy beach, with breathtaking views over the Ionian Sea, this property offers a wide variety of activities such as watersports, tennis, volleyball, mountain biking, a gym and sports entertainment programme plus the largest Spa in Corfu (treatments payable locally). Facilities include an indoor and outdoor pool, 3 restaurants and 2 bars, plus there is a complimentary shuttle bus which runs once a day into Corfu Town. Transfer time from Corfu airport to Ariti Grand Hotel is approximately 10 minutes. You may wish to take an optional excursion during the course of your stay. Full details will be given at the Information Meeting. All tours should be paid for in Euros. Your Tour Leader will help arrange these for you but may not necessarily accompany you.